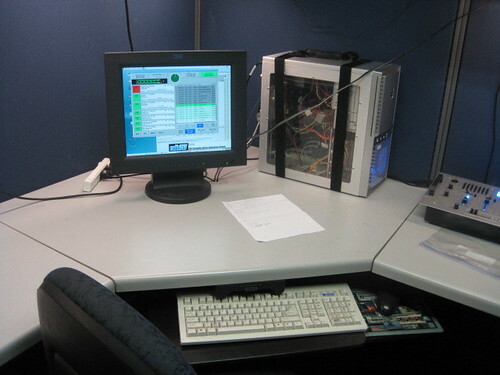 Lab members and visitors know about the strange Linux computer that has been sitting in the cubicle upstairs for a while playing the loop of music. Well, as of a day ago people are listening! The project to do a local internet radio station that focused on local music has been cooking for a while, but I finally got the motivation to get things finished the other night. AltDaily put on an event at the Chrysler Museum and I heard audience members ask questions of local hip hop stars about where they can get their music played at. The panel consisted of Dj Cornbread, DJ Bee, Malice and Chad Hugo and was a nice fun event. It hit me during this as to how much of a good resource this will be to local musicians. So I finished up some needed things and it's live, and new submissions to the station seem to come in every few hours. Being genre neutral is going to be interesting! If anyone at the lab is interested in helping run things, drop Ethan a line. The station is for local music (Hampton Roads out to Raleigh, and Washington DC (but focus on the 7 cities)) so the station won't be for geek/tech specific stuff or commercial music. There is still a bunch of work to be done on it, but it has the potential to make a HUGE positive impact on the lack of community that exists here in Hampton Roads. Listen in (or upload your own music) at www.radio757.com. Special thanks to Sean Bergeron and Kevin McKinley for help with the system setup, and people on IRC for some assistance with web scripting issues. The lonely automation system now has a worldwide audience. 757 Labs will be having another amateur music jam session. We will hold it on Saturday, October 16, 2010. Plan to setup your gear around 5:00 PM EST, and spend the next hour or so messing around with MIDI, pushing buttons, tweaking configurations, etc. Then around 7:00 PM EST, we will get down to business. Feel free to add comments to this post, to let us know who will be attending, and what gear you will be bringing. 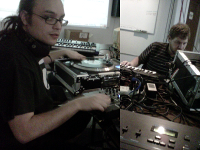 Hopefully, we will have some webcams setup to stream live video, or at least record some audio samples. Anyone interested in electronic music and related musical gear is welcome to attend, regardless of skill level.